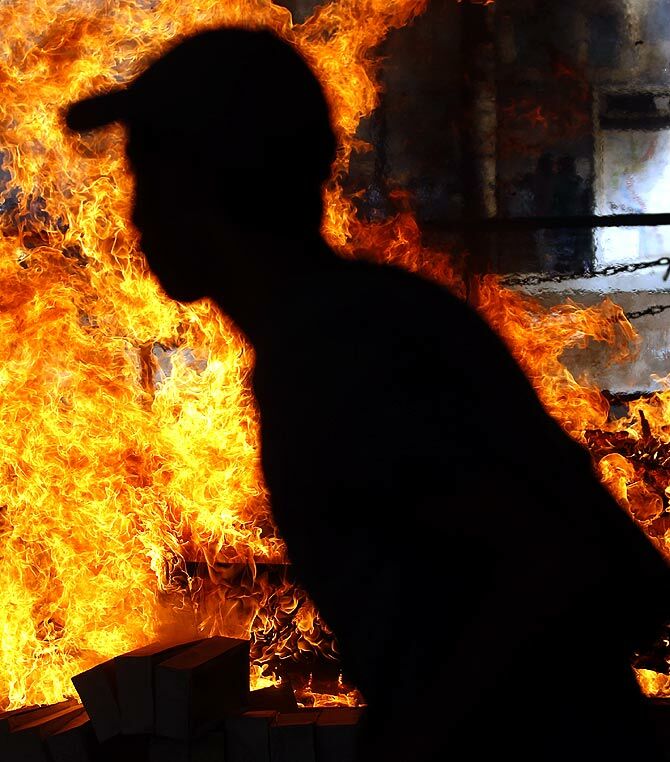 More than a month after the unceremonious ouster of President Mohamed Mursi, Egypt continues to burn with rage and throb with grief. 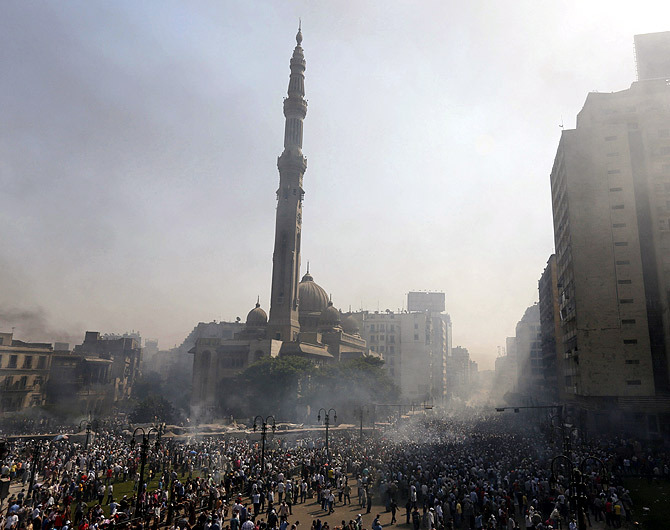 Smoke rises near Al-Fath Mosque during clashes at Ramses Square in Cairo. Thousands of supporters of ousted President Mohamed Mursi took to the streets, urging a 'Day of Rage' to denounce the assault by security forces on Muslim Brotherhood protesters that killed hundreds. 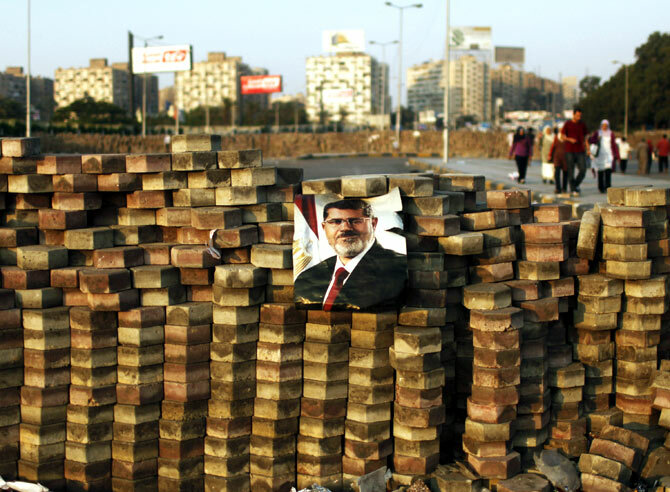 A torn poster of deposed Egyptian President Mohamed Mursi is seen as riot police clear the area of his supporters, at Rabaa Adawiya square, where they had been camping, in Cairo. At least 95 Egyptians were killed after security forces moved in on protesters demanding Mursi's reinstatement, and the government imposed a state of emergency as unrest swept the most populous Arab nation. 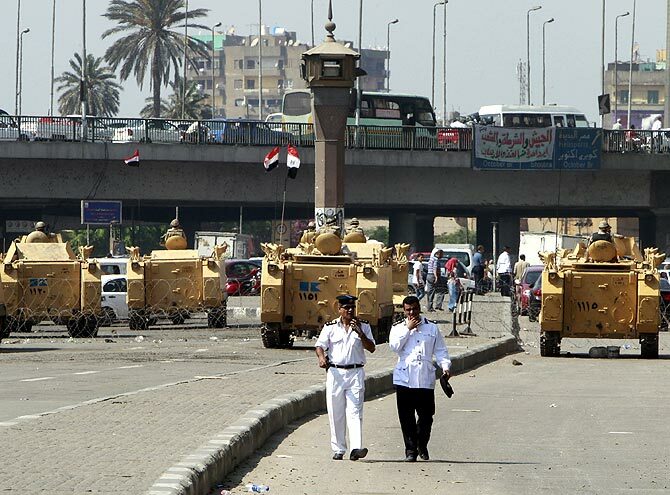 Egyptian army soldiers guard with armoured personnel carriers near Tahrir Square in Cairo. Suspected Islamist militants killed at least 24 Egyptian policemen in the Sinai peninsula, where attacks on security forces have multiplied since the army overthrew President Mohamed Mursi on July 3. Supporters of the Muslim Brotherhood and ousted Egyptian President Mohamed Mursi shout slogans against the military and interior ministry during a protest in front of Al Istkama mosque at Giza Square, south of Cairo. Egypt's army-backed rulers met on Sunday to discuss their bloody confrontation with deposed President Mohamed Mursi's Muslim Brotherhood amid contrasting proposals for compromise and a fight to the death. In a televised speech to military and police officers, army chief Abdel Fattah el-Sisi vowed to crack down on anyone using violence, but also struck an apparently inclusive note, telling Mursi's supporters, "There is room for everyone in Egypt". 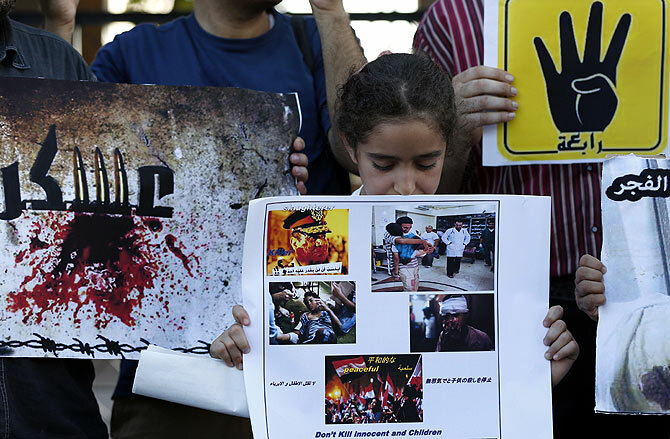 Egyptian residents in Japan hold posters during a rally in protest against the recent violence in Egypt, in front of the Egyptian embassy in Tokyo. Egypt's deputy prime minister will propose a way out of a bloody confrontation between the security forces and the Muslim Brotherhood of deposed president Mohamed Mursi when the cabinet discusses the crisis. A member of the Muslim Brotherhood and supporter of ousted Egyptian President Mohamed Mursi shouts slogans after being injured during clashes in front of Azbkya police station during clashes at Ramses Square in Cairo. Islamist protests descended into a bloodbath across Egypt, with around 50 killed in Cairo alone, on a 'Day of Rage' called by followers of ousted President Mohamed Mursi to denounce a crackdown by the army-backed government. 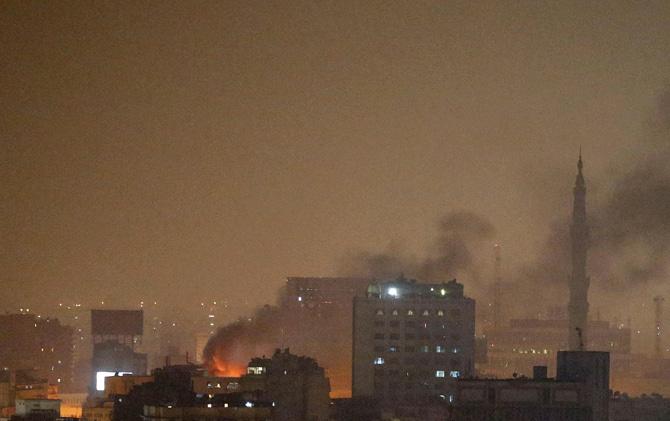 As automatic gunfire echoed across Cairo, the standoff appeared to be sliding ever faster towards armed confrontation, evoking past conflict between militant Islamists and the state in the Arab world's most populous nation. 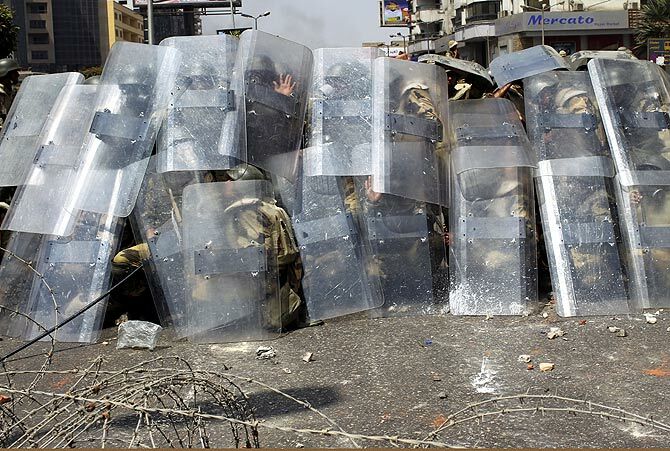 Riot police and army soldiers protect themselves with riot shields as members of the Muslim Brotherhood and supporters of ousted Egyptian President Mohamed Mursi throw stones during clashes around the area of Rabaa Adawiya square, where they are camping, in Cairo. The death toll from an Egyptian police raid on supporters of Mursi at a Cairo protest camp has climbed to 60 at one hospital, according to a nurse, who said she counted the bodies. Riot police fire tear gas during clashes with members of the Muslim Brotherhood and supporters of deposed Egyptian President Mohamed Mursi, around Cairo University and Nahdet Misr Square, where they are camping in Giza, south of Cairo. 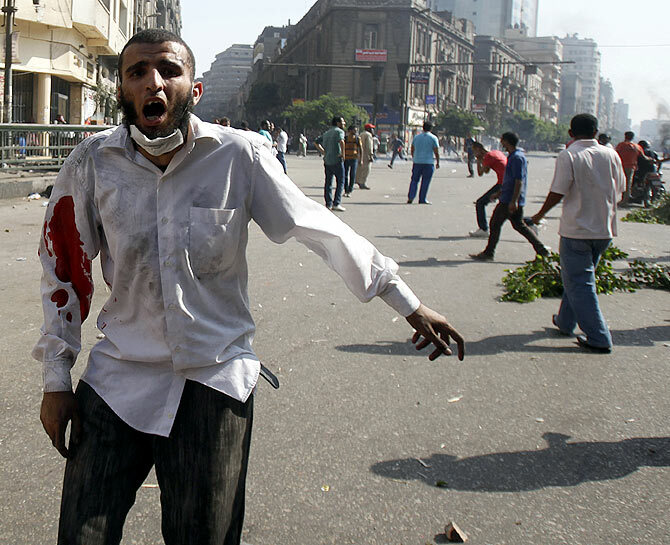 Egyptian security forces killed at least 30 people when they cleared a camp of Cairo protesters who were demanding the reinstatement of Mursi. Bricks form the Arabic words: 'There is no god but Allah' as smoke rises during clashes between riot police, and members and supporters of the Muslim Brotherhood, at Rabaa al-Adawiya Square, where the latter had been camping, in Cairo. 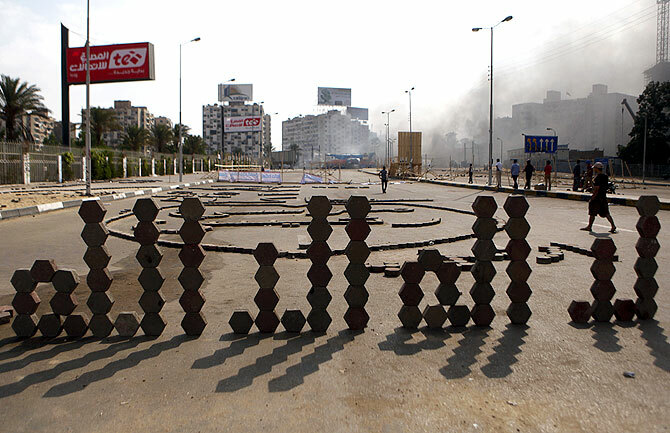 Supporters of deposed Egyptian President Mohamed Mursi (depicted in poster), walk behind a makeshift barrier built to demarcate their sit-in area around Raba' al-Adawya mosque, east of Cairo. Egypt's army-backed rulers and allies of its deposed Islamist president gave the first signs of a readiness to compromise, pressed by Western envoys trying to head off more bloodshed. Supporters of deposed Egyptian President Mohamed Mursi shout slogans during a march from Al-Fath Mosque to the defence ministry, in Cairo. 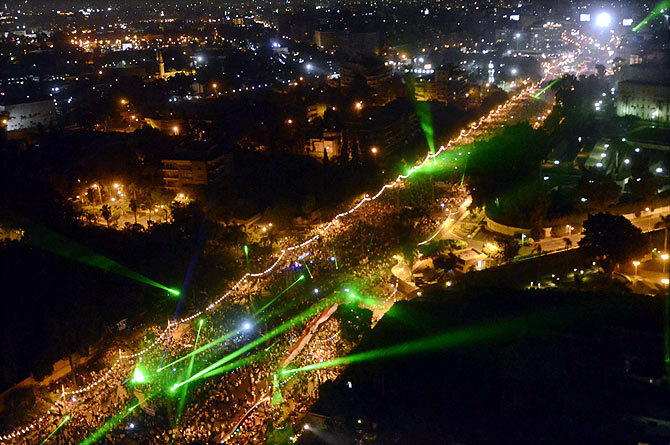 Anti-Mursi demonstrators illuminate the night sky with laser pointers during a mass rally showing support for the army near Tahrir Square in Cairo, in a handout photo by the Egyptian Army. At least seven people were killed and hundreds wounded in scattered violence across Egypt during mass rallies for and against the army's overthrow of Islamist President Mohamed Mursi, who was placed under investigation for murder. 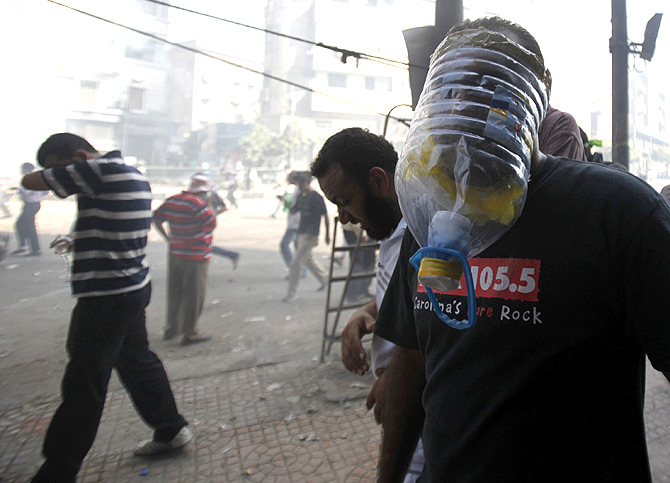 A member of the Muslim Brotherhood and supporter of ousted Egyptian President Mohamed Mursi wears a makeshift gas mask as others run away from shooting during clashes in front of Azbkya police station during clashes at Ramses Square in Cairo. .Muslim Brotherhood protests plunged into violence across Egypt, with around 50 killed in Cairo alone on a 'Day of Rage' called by Islamist followers of ousted President Mohamed Mursi to denounce a police crackdown. 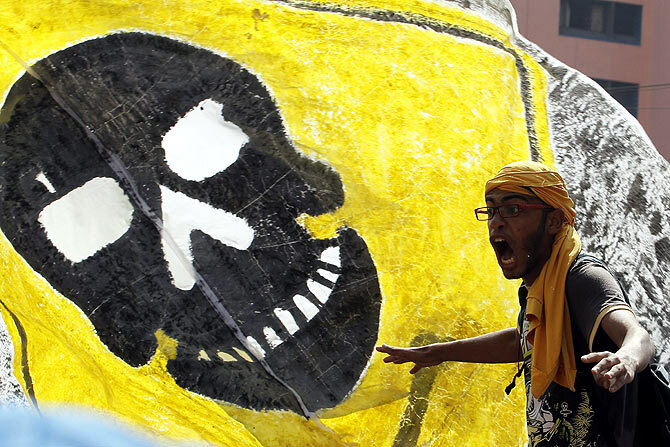 A supporter of deposed Egyptian President Mohamed Mursi shouts slogans during a protest outside Al-Fath Mosque in Ramses Square, in Cairo. 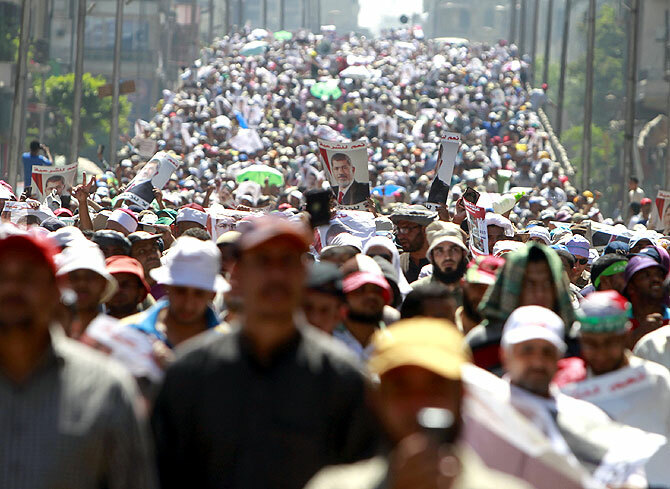 Thousands of supporters of Mursi took to the streets, urging a 'Day of Rage' to denounce the assault by security forces on Muslim Brotherhood protesters that killed hundreds. The army has deployed dozens of armored vehicles on major roads in Cairo, and the interior ministry has said police will use live ammunition against anyone threatening state installations. 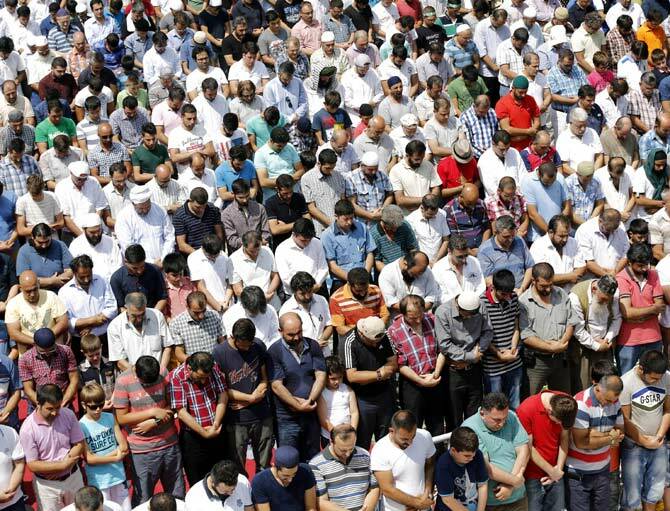 Worshippers and supporters of Egypt's deposed Islamist President Mohamed Mursi attend Friday prayers at the courtyard of Eyup Sultan mosque, before a rally in protest against the recent violence in Egypt, in Istanbul. 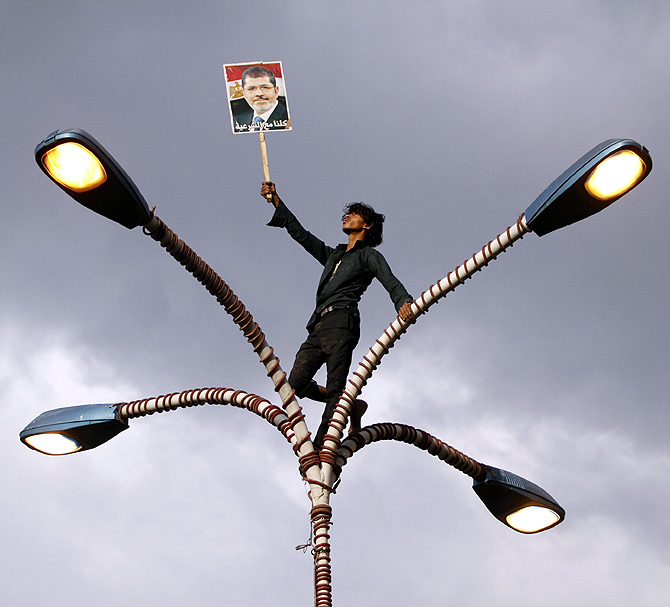 A supporter of deposed Egyptian President Mohamed Mursi holds up his photo while standing at the top of lamp posts during a march to show solidarity with his supporters in Egypt, in Sanaa. The poster reads 'We are all with legitimacy'. The mother of a dead Muslim Brotherhood supporter screams after seeing her son's body at the El Eyman mosque in Cairo. Egypt's Muslim Brotherhood called on followers to march in protest in Cairo, after at least 525 people were killed in a security crackdown on the Islamist movement that has left the most populous Arab nation polarised and in turmoil. A Reuters witness counted 228 bodies, most of them wrapped in white shrouds, arranged in rows on the floor of the Imam mosque in northeast Cairo, close to the worst of the violence between police and demonstrators. Egyptian military helicopters trailing national flags circled over Tahrir Square during a protest demanding that Egyptian President Mohamed Mursi resign in Cairo. 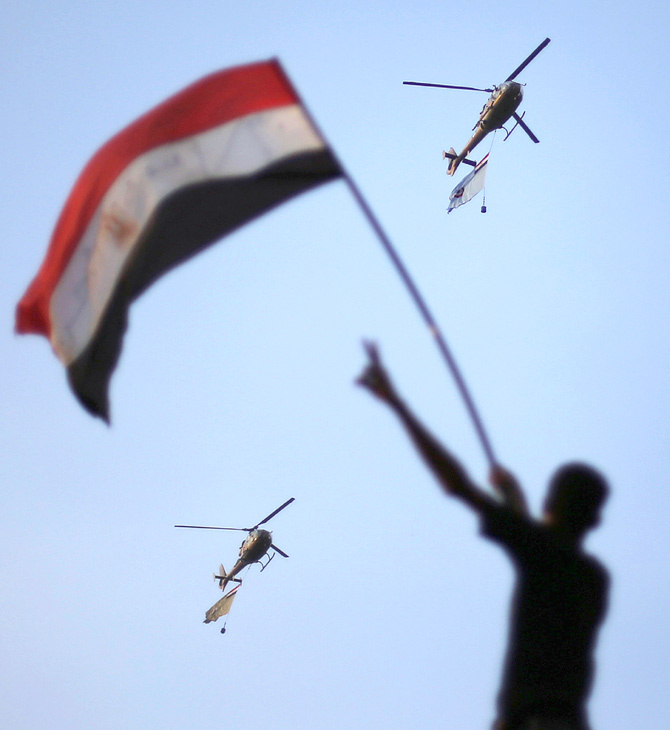 Five Egyptian military helicopters trailing national flags circled over Cairo on Monday after the armed forces gave politicians 48 hours to resolve a crisis over calls for the resignation of Islamist President Mohamed Mursi. 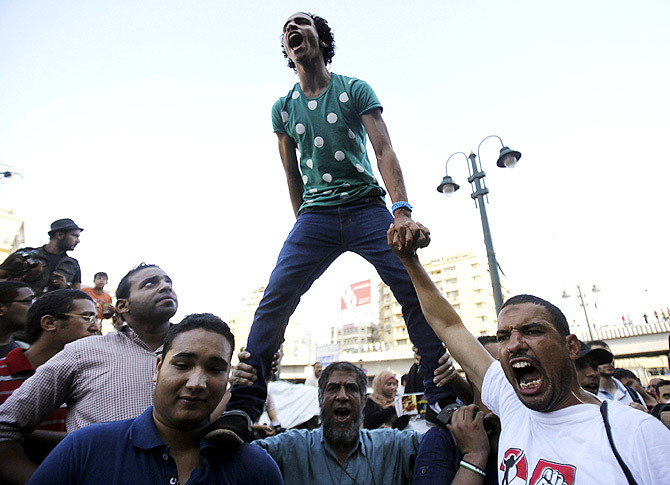 Protesters opposing Egyptian President Mohamed Mursi shout slogans against him and Brotherhood members during a protest at Tahrir Square in Cairo. 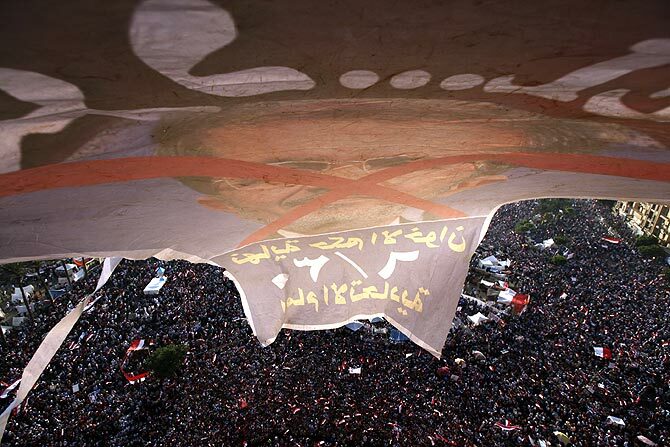 Egyptians poured onto the streets, swelling crowds that opposition leaders hope will number into the millions by evening and persuade Islamist President Mohamed Mursi to resign. A policeman takes up a position inside a mosque during clashes with supporters of deposed Egyptian President Mohamed Mursi inside a room of the al-Fath mosque in Cairo. 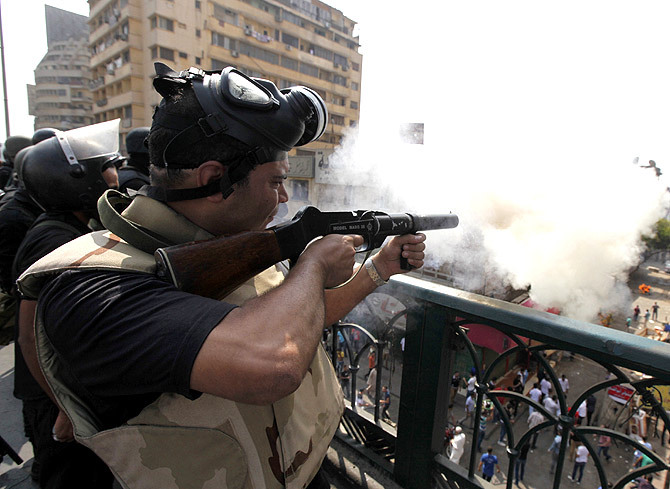 Mursi supporters exchanged gunfire with security forces inside the Cairo mosque, three Reuters witnesses said. 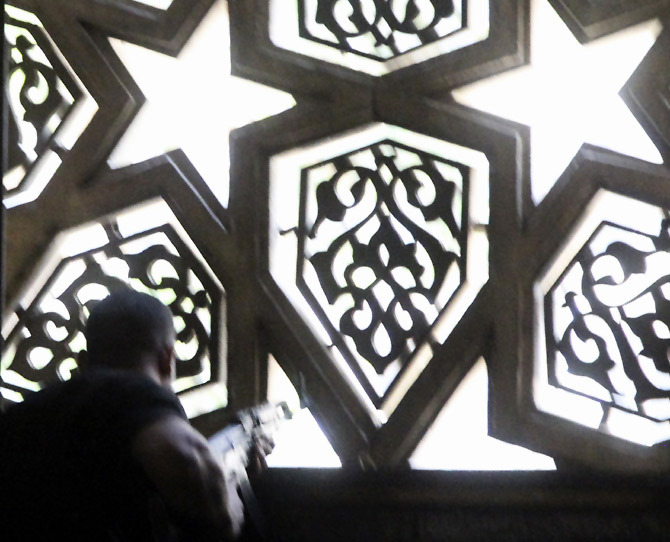 The gunmen opened fire on security forces from a second floor window in the Fath mosque, where hundreds of Mursi supporters have been taking refuge since protests turned violent. 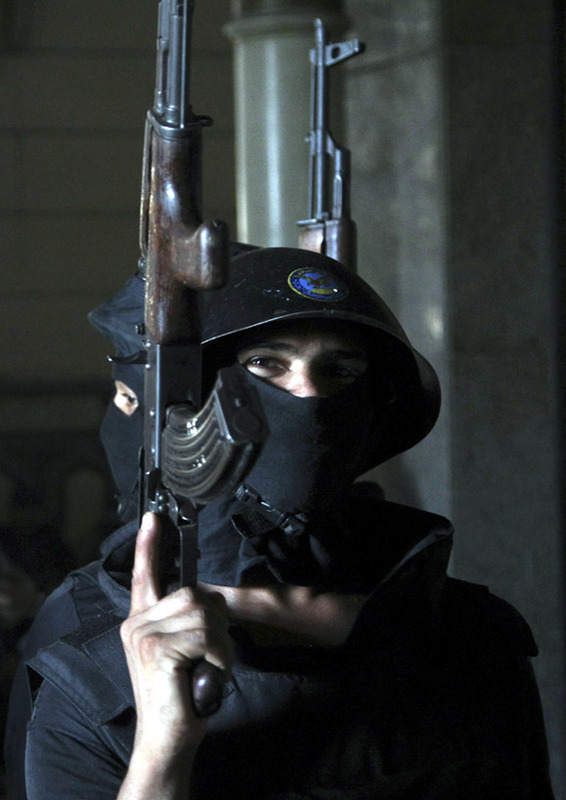 A police officer takes position during clashes with supporters of deposed Egyptian President Mohamed Mursi inside a room of al-Fath mosque in Cairo. Smoke is seen over Ramses Square after Islamist protests descended into a bloodbath across Egypt, with over 50 killed alone on a 'Day of Rage' called by followers of ousted President Mohamed Mursi to denounce a crackdown by the army-backed government after clashes in Cairo. The government has imposed a night-time curfew set to last at least a month. 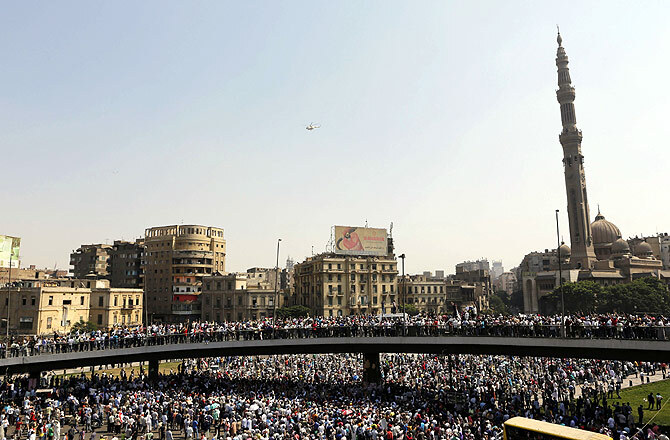 A military helicopter flies above supporters of ousted Egyptian President Mohamed Mursi, in Cairo. Thousands of supporters of Mursi took to the streets on Friday, urging a 'Day of Rage' to denounce this week's assault by security forces on Muslim Brotherhood protesters that killed hundreds. 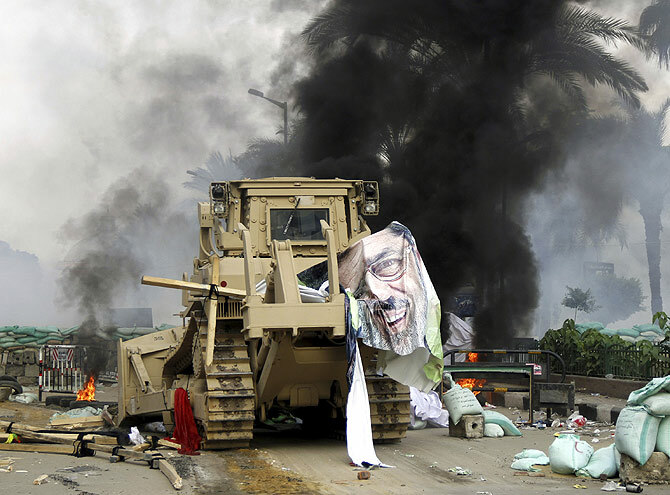 The army deployed dozens of armoured vehicles on major roads in Cairo. The interior ministry has said police will use live ammunition against anyone threatening state installations. 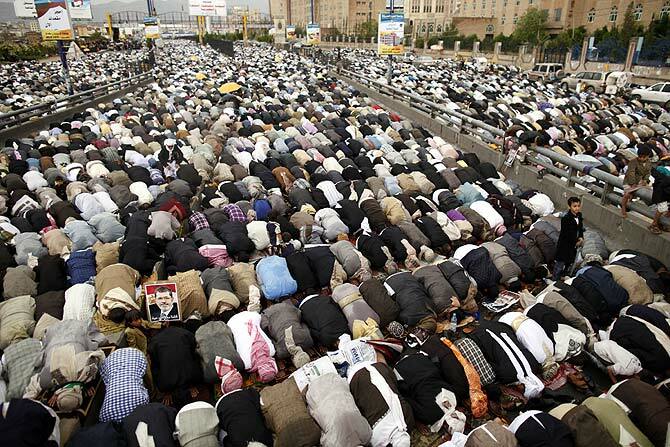 Supporters of Egypt's deposed Islamist President Mohamed Mursi pray during a rally in protest against the recent violence in Egypt, in Sanaa. Protests by Mursi supporters turned violent across Egypt, with witnesses reporting four dead in central Cairo and at least 12 killed in northern cities as the Muslim Brotherhood staged a 'Day of Rage'.